Popular options are screens or 4 track windows with screens. The 4-track comes with tinted or clear film, they are easy to use and take care of. 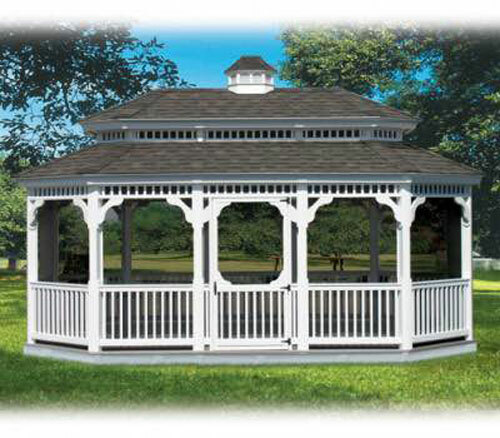 The gazebos also comes with a screened in floor. Add electric for lights or a ceiling fan. A great accessory is a gas fire pit to add some warmth in the spring, late summer, and early fall. Size available 8′, 10′, and 12′ wide lengths are 14′ to 24′. This gazebo is made from a 40-tested double kiln dried southern yellow pine then we wrap it with a vinyl and use a Azek maintenance free floor. It has architectural shingles and the vinyl colors are white, ivory or clay.